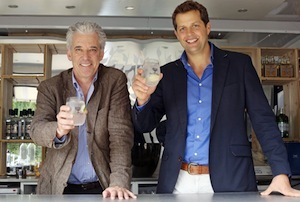 It's drinks on the posh tonic maker's founders Charles Rolls and Tim Warrillow. Fever-Tree founders Charles Rolls and Tim Warrillow will no doubt be getting the rounds in tonight, after shares in the posh tonic maker fizzed on their first day of trading. Shares opened 27% higher at 170p, after 60% of the company was floated at 134p a share. They have now settled down around 167p, giving it a market cap of £192m. Warrillow and Rolls, the former boss of Plymouth Gin, dreamed up the company in 2003 after they spotted a gap in the market for premium mixers. They launched it two years later after tracking down all-natural ingredients, including quinine from the war torn eastern Democratic Republic of Congo. Even after selling off 40% of their stakes in the float, Rolls and Warrillow will both still be a few million richer. Their adviser Investec had gone for a more conservative share price after stock markets hit a storm that prompted challenger bank Aldermore to pull their float and Virgin Money to delay theirs. And if they do feel a little sore at the extra money they could have made selling their stake, it must be a nice pick-me-up to see their company’s shares fizzing away.